Oxford was one of the first universities in Britain to have a judo club. We give a very brief ‘timeline’ history of the Club below. The booklet History of Oxford & Cambridge University Judo (1987) by Tim Green (Oxford Captain 1984) is the major source for 1926-1986. 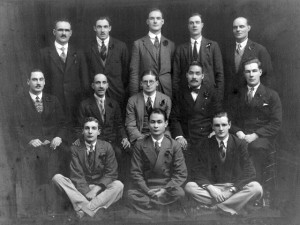 1926 The earliest evidence of OUJC is a photograph (above) combined with the Metropolitan Police. Appearing in the photograph is Gunji Koizumi (middle row, second from right), founder of the London Budokwai in 1918. It is believed that Koizumi and the Budokwai’s first chief instructor Yukio Tani commuted regularly to Oxford following requests by undergraduates. 1930 The first judo match against Cambridge University took place on 27th February at the Corn Exchange, Oxford. The match was won by Cambridge (3-2) who thereby became the first recipients of the solid silver Judo Challenge Cup, presented to the Oxford & Cambridge Clubs by the Japanese Ambassador and President of the Budokwai Viscount Matsudaira. 1935 Ralph Morris-Owen (Balliol, 1930) became the Club’s first black-belt after captaining the Oxford side in 1934. He returned to Balliol to read Medicine in 1946 and was Captain again in the first post-war match in 1950 – some sixteen years later! His enduring contribution to the club is today recognised in the Ralph Morris-Owen Cup. 1953 Some quality judo displayed during the post-war Varsity Matches earned judo Half-Blue status at Oxford. Half-Blues were subsequently awarded to all eight members of Varsity Match teams. 1964 After a string of Varsity Match losses the Club enrolled the services of British international and Olympian Tony Sweeney of the Budokwai and who had recently represented Great Britain in the Tokyo Olympic Games. Tony is still the Chief Instructor at OUJC and we enjoy his regular visits to Oxford and continued interest in the Club. 1966 Iffley Road Sports Complex opens and Oxford become one of the first university judo clubs with a permanent dojo. 1967 Captained by Bob Darby, Oxford were runners-up in their first overseas tournament since 1932, held at the Technical University of Eindhoven, Holland. 1969 British University judo was flourishing generally and in 1969 judo became a Discretionary Full-Blue sport in Oxford. The first Full-Blue was awarded to Bob Darby (Captain 1967 and 1968). 1987 Oxford Men win British Universities tournament for the first time.